If you are starting to get excited about the March Madness events, you will be looking for anything which gives you some insight into what may happen at this major event. This is why it is good to see that there are betting odds already available for the big games taking place on Saturday and Sunday in Indiana. 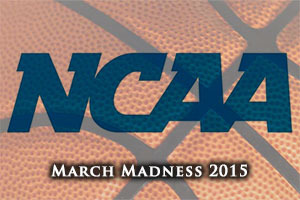 If you are looking to bet on the 2015 March Madness tournament, you really need to start making a move. This is the Saturday game in the Final Four and at this early stage, it looks as though the bookmakers are getting behind Duke in this clash. They can be found with a -5 handicap at odds of 1.90 at the point, and they are definitely the tip for most people to get through to the final. At the moment, the Over/Under market is based on 138.5 points and you can go OVER or UNDER that mark with odds of 1.90. There are also some winning margin bets available under the Props bet sections already and it looks as though the 3-6 winning margin is the most popular for both teams. Michigan State are listed at 7.50 to win the game with a 3-6 point margin while Duke are listed at 5.50 to win the game with a 33-6 point margin. There are times when you would be forgiven for thinking that Kentucky were the only team in this years March Madness. Yes, their story is a hugely interesting and exciting one, standing as they are on the brink of history but there are two teams in every game. As you would expect, Kentucky are the favourites but with a handicap of -5, at odds of 1.90, they are not runaway favourites. Then again, at this stage of any major tournament, it is very rare to see any team being listed as such a clear favourite because all it takes is one or two things to run one way and before you know it, you have an upset on your hands. The Over/Under market is currently based at 131.0 with odds of 1.90 available for going OVER and UNDER, which may be something that you want to keep an eye on in the lead-up to this game. Similar to the winning margin bet for the other Final Four game, the 3-6 winning margin is tipped to the most popular. Wisconsin are listed at 7.50 to win by 3 to 6 points while Kentucky are listed at 5.50. At this stage of the tournament, any sort of win will be more than welcome but a 3-6 margin means that these games will be going down to the wire. There is still plenty of time to get involved with betting on the Final Four at the 2015 March Madness event and if you would rather wait until your Easter holiday really kicks in, there is no rush to make a move now. However, having some early insight into the way that the betting sites are thinking is never a bad thing in life. This weekend is set to be a magical one, it could even be a historical one, and placing a bet or two on the March Madness games and outcome may be exactly what some people are looking for.